In 1944, Witton C. Dinges, collaborated with Alcoa experts to design the first Emeco Navy Chair, for use on submarines as 'war ship ready' furniture. This eye-pleasing, durable and lightweight chair caught the attention of many famous architects and designers over the years, including Frank Gehry and Norman Foster. Over 70 years later, this iconic chair is still being made with the same 77 step design process. My favorite reincarnation of the original, however, is the collaboration between Emeco and Atlanta based company, Coca-Cola, which sought to alleviate the burden of excess consumer waste. As the Emeco Navy chairs are made with 80% recycled aluminum, this particular version is made with recycled Coca Cola bottles. This chair debuted in Milan in 2010 and received rave reviews. It's cheaper than its original counterpart (find here for $260) and is named The Emeco 111 as each chair is made from 111 recycled Coca Cola bottles. An impressive 20,000 recycled bottles are sent to New United Resource Recovery Corporation in Spartanburg, South Carolina each weekday to be sorted, ground, wet and dry washed, then sorted by color. After much processing and rendering, 13 pounds of plastic pellets are melted down and injected into each chair mold. Next, the chairs are hollowed out via gas injection, then tempered and cooled. The chairs then head to Bemis Manufacturing in Lenoir, North Carolina and BASF in Chattanooga, Tennessee for all the final tweaking and coloring. 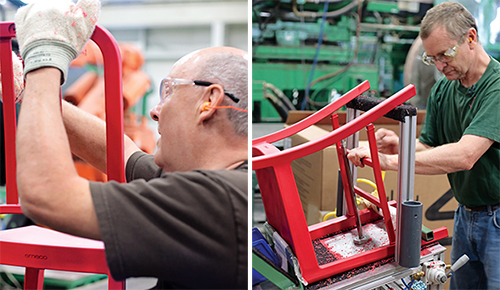 As stated on dwell.com, "This final laying on of hands, labor intensive though it may be, is the hallmark of Emeco's Navy Chair legacy." Each 111 Navy Chair is just like the aluminum original, even including the faux weld points on the backside. I love that this beauty is made in the South with a sincere care for integrity and quality. 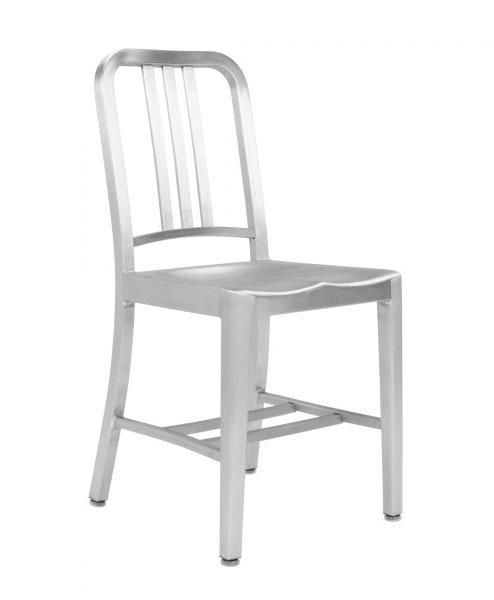 Find your very own Emeco 111 Navy Chair, which I dare say will never go out of style, here.